The October 2016 expert survey of the Centre for Macroeconomics (CFM) and CEPR invited views from a panel of macroeconomists based across Europe on Germany’s trade surplus, its impact on the Eurozone economy, and the appropriate response of German fiscal policy. 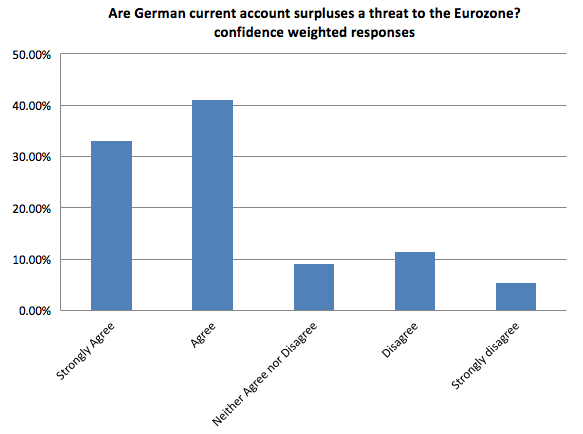 More than two-thirds of the respondents agree with the proposition that German current account surpluses are a threat to the Eurozone economy. A slightly smaller majority believe that the German government ought to increase public investment in response to the surpluses. Germany posted a record-high current account surplus of 8.5% of GDP in 2015; indeed, the German surplus has overtaken China’s surplus as the largest in the world. Germany’s current account was slightly in deficit when the euro was created in the late 1990s, it steadily increased in the early 2000s and has continued to rise since the Global Crisis of 2008. Since 2010, the increase in the current account has been accompanied by fiscal surpluses, with the German government moving from a deficit of 4% of GDP in 2010 to a surplus of 1.2% in the first half of 2016. Through the prism of the trade balance, the current account surplus can be viewed as a symptom of Germany’s economic success. German exports increased from 30% of GDP in 2000 to 47% in 2015. But with imports at merely 39% of GDP, this implies that Germany is providing capital to the rest of the world at a very high rate. Indeed, German savings have increased from roughly 20% to nearly 30% of GDP, while domestic investment has remained roughly constant at around 20% of GDP. One view, harking back to Keynes, is that such large capital flows could be very destabilising, particularly within a system of fixed exchange rates (or a currency union). The argument is that while countries with current account deficits may come under severe pressure to adjust, countries with surpluses face no corresponding pressures.1 Keynes’s solution – which was part of the inspiration for the creation of the IMF – was that occasional exchange rate adjustments might be necessary in order to rebalance international credit flows. The IMF (2016) and the European Commission (2016) have both warned of the risks of Germany’s current account surpluses; and both have urged Germany to take actions to reduce its external surplus, for example, by increasing public investment. While the nature of the Eurozone makes exchange rate adjustments impossible, the IMF reckons that Germany’s real exchange rate is now 15-20% undervalued (IMF 2016, p. 7). The US Treasury has gone so far as to add Germany to its ‘monitoring list’ of countries engaged in ‘unfair currency practices’, even though Germany does not have a national currency (US Treasury 2016). 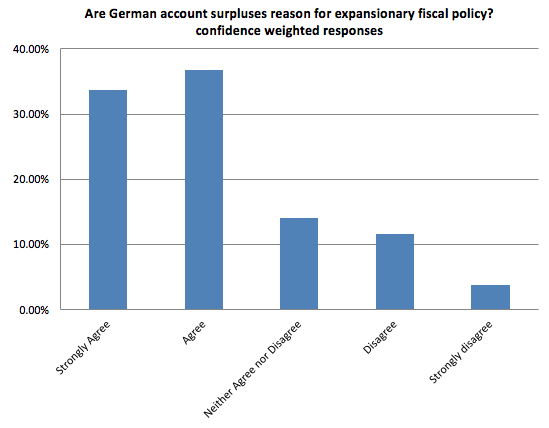 The first question in the October 2016 expert survey of the Centre for Macroeconomics (CFM) and CEPR addressed the question of whether large German surpluses are reasons for concern.4 To focus the question, we asked the experts about its consequences for the Eurozone, but they were free to address wider implications in their comments. 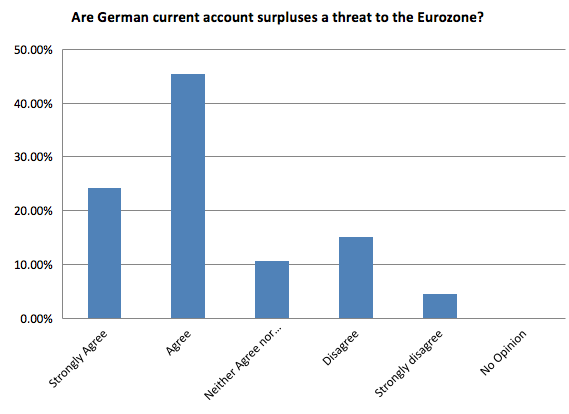 Q1: Do you agree that German current account surpluses are a threat to the Eurozone economy? Sixty-seven panel members answered this question and a large majority (69%) agree or strongly agree with the proposition. A number of panel members point to evidence of the risks of current account balances. Ricardo Reis (LSE), for example, says that “current account imbalances during 2000-08 played a central role in the Eurozone crisis of 2010-12” (see Obstfeld 2012 and Lane 2013). Simon Wren-Lewis (Oxford) agrees that “the surplus represents an undervalued real exchange rate in Germany, which requires more inflation in Germany relative to the rest of the Eurozone”. A number of panel members (Charles Bean, LSE; Jonathan Portes, National Institute of Economic and Social Research) warn that Germany’s current account surplus is not uniquely a Eurozone problem, but is also large enough to contribute to the low global real interest rates. The global dimension is also the main counter-argument of the panel members who think that the German current account is not a threat to Eurozone stability. Robert Kollman (Université Libre de Bruxelles) points out that “the German current account surpluses do not represent a threat to the Eurozone economy, because Germany trades more with the rest of the world than with the rest of the Eurozone”. Pietro Reichlin (Università LUISS G. Carli) caveats his concern about the German current account with the view that “part of the surplus is due to exports to extra-European countries and these benefit some EU peripheral economies that are exporting intermediate inputs and parts to Germany”. With exchange rate adjustment off the table within a currency union, the main policy recommendation to reduce Germany’s current account surplus has been a change in German fiscal policy. Martin Wolf points out that the current account surplus is driven primarily by an increase in the supply of savings of German households and thus reflects insufficient aggregate demand.5 He warns that Germany isn’t carrying its weight in the global economy and has failed to contribute to global aggregate demand. By this view, the German government’s move to fiscal surplus is a direct drag on the global recovery. The argument is that with interest rates at zero and other governments in worse fiscal positions, the German government should do more to contribute to European and global demand. The IMF has called on Germany to “focus on raising potential growth and reinforcing rebalancing, which will also support the fragile recovery in the euro area”, including the use of fiscal resources to “boost high quality public investment”. The European Commission concurs that “weak investment has contributed to the high and persistent current account surplus and poses risks for the future growth potential of the German economy”. The Commission joins the IMF in suggesting that “there continues to be fiscal space for higher public investment, while complying with the rules of the stability and growth pact”. The second question in our survey asked the experts whether the current account imbalance is a reason for the German government to increase public spending. We were not asking whether public spending should increase for other reasons (say low interest rates), although current conditions may – of course – affect the answers given. The question was explicitly conditioned on the fact that Germany is part of the Eurozone and we asked the respondents to answer from the point of view of the Eurozone. That is, when countries’ fiscal deficits are high, the Eurozone regularly demands that action is taken to reduce public spending: so does it similarly make sense for the Eurozone to ask Germany to increase public spending given its large current account surplus? Q2: Do you agree that the German government should increase public spending given its persistently large current account surplus and given that it is part of the Eurozone? 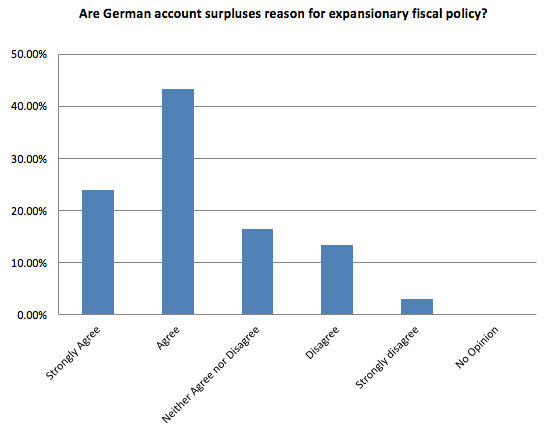 Sixty-seven panel members answered this question with a large majority (67%) agreeing or strongly agreeing that the German government ought to increase public spending in response to the current account surpluses. Another argument in favour of a German fiscal expansion relates to the asymmetry of fiscal rules in the Eurozone. Costas Milas (University of Liverpool) points out that “the EU Treaty talks about ‘corrective’ fiscal measures when the deficit exceeds 3% of a country's GDP. There is no similar mechanism in case of a (relatively) big fiscal surplus”. A number of panel members support policy action, but not an increase in public spending. Francesco Giavazzi (IGIER, Università Bocconi) and Nicholas Oulton (LSE) advocate tax cuts. In addition, Jürgen von Hagen (Universität Bonn) warns that fiscal action is desirable at the federal level, but not at the state level: “Lander public finances are mostly unsustainable and an increase in spending is not called for.” Wendy Carlin (University College London) proposes increasing incentives for women to participate in the labour force. Evi Pappa (European University Institute) adds: “In my own research, I also show that fiscal consolidation, as a means to induce an internal devaluation in a two country model works, but it affects very little economic activity in the periphery. A more effective way for correcting current account imbalances is transferring resources from Germany to the periphery” (see bandiera et al. 2016). European Commission (2016), “Country Report Germany 2016”, Commission Staff Working Document SWD(2016) 75 final. IMF (2016), “Germany”, IMF Country Report No. 16/202. Kim, S, and N Roubini (2008) ‘Twin Deficit or Twin Divergence? Fiscal Policy, Current Account, and Real Exchange rate in the U.S.’, Journal of International Economics 74: 362-83. Kollmann, R, M Ratto, W Roeger, J in’t Veld, and L Vogel (2015) ‘What Drives the German Current Account? And How Does it Affect Other EU Member States?’, Economic Policy 30: 47-93. Kollmann, R, B Pataracchia, R Raciborski, M Ratto, W Roeger, and L Vogel (2016) ‘The Post-Crisis Slump in the Euro Area and the US: Evidence from an Estimated Three-Region DSGE Model’, European Economic Review 88: 21-41. Lane, P (2013), “Capital Flows in the Euro Area”, CEPR Discussion Paper No. 9493. Obstfeld, M (2012), “Does the Current Account Still Matter?”, NBER Working Paper No. 17877. US Treasury (2016), Foreign Exchange Policies of Major Trading Partners of the United States, Report to Congress. Full survey results are available at http://cfmsurvey.org.